As 2007 draws to a close, I once again begin to reminisce about how far this site has come from its humble beginnings to its present form. While the look and feel of this site has changed throughout the years, its mission to share and promote water warfare information with others remains the same. This article will touch upon some of the lesser-known parts of iSoaker.com history and, perhaps, offer some clues about what the future may hold. The above collage shows thumbnails of the various major iterations of Aquatechnology/iSoaker.com Splash pages from 1998 to 2007. These images together with a brief site description are available to view on the iSoaker.com History pages. The domain, iSoaker.com, has been in existence since June, 2000, while this site's beginning dates back to 1998. My interest in website design began in 1997 when the Internet as we know it was still fairly young. 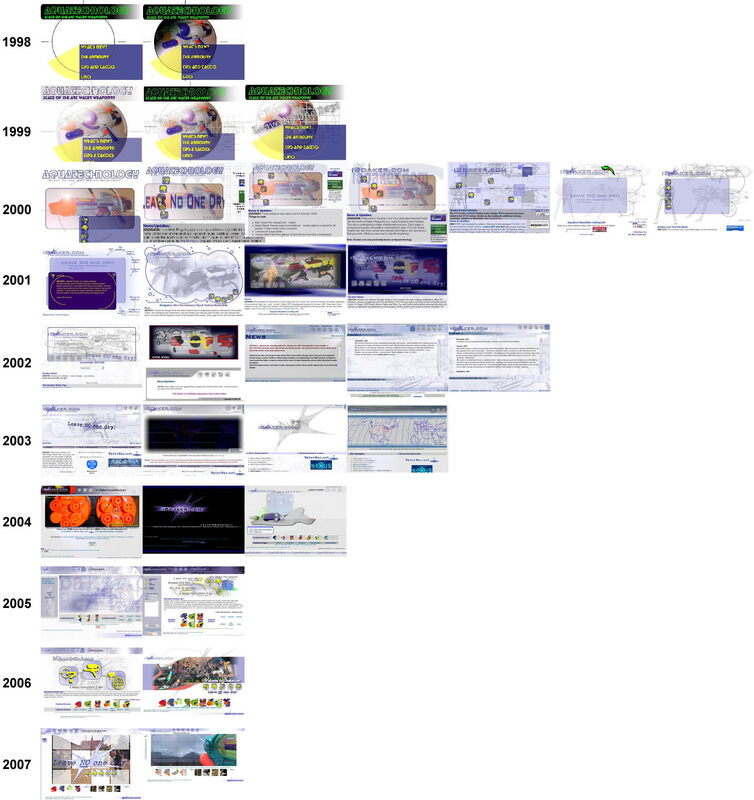 I still recall using NSCA Mosaic back in 1992-1993 for doing some scientific searches, but more was slowly coming online in 1996-1997. My family had recently got a new computer with a 14400bps modem and a dial-up connection to a local ISP. The ISP also provided us with some webspace, allowing us to host some files on their server. If I recall correctly, we were given 2 to 5Mb of space online which felt quite roomy back then. I spent time playing with various graphics programs such as Corel Draw 3.0 and GifAnimator for making simple images and moving sprites. Seeing my interest with developing things on the computer, my mother asked me to help her design a website to showcase various things about her school. This request got me more eager to produce a great site for her school as well as hone my skills at image manipulation and website development. Using cutting edge HTML tools of the time like Netscape Editor as well as good old MS Notepad for careful HTML manipulation together with my growing knowledge of graphics manipulation of .gif and .jpg files, a site for my mother's school was created that impressed her and even the school's prinipal. The year, 1997, also marked the beginning of my graduate studies. As the Internet back then seemed to be primary useful as a research tool, I began to create a site based on some of graduate work. 1997 was also the year I got my hands on the Super Soaker CPS2000. I had seen the CPS2000 back in 1996, but as I had little free spending cash back then, I was not able to afford it on my limited budget. However, thanks for graduate school stipends, when I found it again in stores in 1997, I picked one up, not fully realizing what would become of this purchase. After getting home, unpacking it, filling, pumping, and pulling the trigger, I was hooked. Sure, I have owned a number of water blasters in the past including an Entertech Water Hawk, an Aqua Force water gun, a Super Soaker 50, and a Super Soaker XP75, nothing even before unleash such a burst and exuded grace and power from a water gun the way the CPS2000 did. Having tasted pure soaking joy, I decided to see whether I could find any more information online regarding water guns. Searching Yahoo, I was able to find a handful of sites including Super Soaker Arsenal and MiB Alliance, websites dedicated to water warfare. I recall many days I spent visiting these sites, reading and rereading the information they contained and seeing what else was being posted over time. It was great to find others who had a similar interest and enthusiasm in soaking others like myself. As well, there were so many older models of Super Soakers that were viewable online that I had never seen, making me wonder what else I had missed out on. In the spring of 1998, I was shopping for something else when I came upon a site I have never seen since; a pure wall of Super Soakers that towered over me. Before me stood scores of CPS1000s, CPS1500s, CPS2500s, and the impressive CPS3000s. There were also XP110s, but those looked so small compared to the CPS-series. That day, I purchased the CPS1000, CPS1500 and CPS2500. After my next paycheck, the CPS3000 was then in my possession. Checking the handful of water warfare sites online, news of the new CPS-series was coming in. Seeing the great interactions between members of the MiB Alliance Yahoo board, I opted to join it and engage in the discussions. As well, seeing that I might also be able to contribute some useful information using the space my ISP provided, I decided to also create a website for water warfare, calling it Aquatechnology as my interest lay primarily in how well these soakers looked and performed. My experience in water warfare was mostly limited to free-for-alls, thus could not contribute much in terms of strategies or tactics, but my scientific background meant that I could perhaps offer a slightly more objective view on how well these water blasters performed. Aquatechnology - For the Extreme Water Warrior (See the original site here) was launched in the summer of 1998 with four soaker reviews (i.e. CPS1000, CPS1500, CPS2000, CPS2500) with the CPS3000 review added soon after. During 1999, my obsession with water blasters continued to grow as I collected more soakers and added more information to Aquatechnology. Aquatechnology, itself, went from a mostly overlooked website credited solely for its pictures to a budding information source as more soaker reviews became available. In mid-August, 1999, Aquatechnology got "Flashed up" for the first time (See the 1999 Flash site), adding in Macromedia Flash animation, sound, and interactivity to the site. This new web techology allowed some interesting interactivity to be created while not costing much in terms of raw bandwidth; however, not all were happy about the addition of Flash to the site as those without Flash viewer would not be able to view the newer content. The balance of what content ended up in Flash or not ended up tweaked and refined for many years after. Presently, Flash is used a little more sparsely on the site, but its usefulness particularly for quick site navigation, product browsing and inspection remains. By 2000, having found myself quite comfortable with website building as well as becoming quite knowledgeable in the world of water blaster technology, it felt the right time to acquire a domain name for Aquatechnology. However, Aquatechnology.com was taken by a plumbing company back then (they apparently no longer own that domain name which is presently held by a cyber-squatter). Not to be disuaded from having a domain name and seeing that some sites had added "i" in front of their name to denote the Internet, I registered iSoaker.com and launched iSoaker.com in June, 2000. As opposed to Aquatechnology's not-quite-accurate slogan "For the Extreme Water Warrior", I opted instead to use the motto "Leave NO one dry!" for iSoaker.com. Since 2000, iSoaker.com has been steadily increasing in size as more soaker reviews have been added as well as the fair number of submitted reviews, articles, stories, and more that have been added to the site. The Splash page designs as can be seen above have gone through a variety of styles and colours over the years. 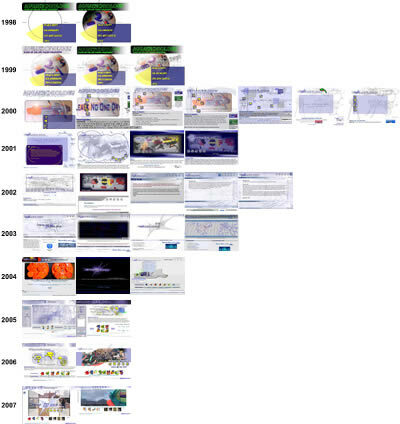 From 1998 to 2002, one could say that the amount of information being presented on the first page of the site had steadily increased, peaking in 2002. From there, information content on the main page remained constant for a few months, then began to decrease back to a simpler, cleaner designs. This change reflects some of my thoughts in site-design preferences over the years, going from the idea that "more-is-more" to the belief that "elegance-is-more" when it comes to grabbing visitors' attentions. In the early years of site development, I held the belief that enthusiasts enjoyed seeing what was newly added to the site as soon as they visited the main page. While this may be true for repeat visitors, inundating a new visitor with a bunch of update info upon first visit is not necessarily the best way to grab their attention. Repeat visitors could make their way to the News page to find out what the latest change was, but I decided that it is still more beneficial to make a good first impression for any new visitors who stumble across the site. As such, the latest incarnations of the site now feature attention grabbing images. Some say visitors judge a website within the first couple of seconds they view it, thus interesting imagery is included to hopefully hold their attention just that bit longer such that they would then choose to explore further. Of course, compared to the main page of Aquatechnology, the latest clean-designs of iSoaker.com do offer many more deep links into the site. While main section links are most visible, the Flash Header offers some deeper linking to commonly accessed sections of the site. As well, thumbnail images are used as a visual link to some of the latest entries and submissions to the site. Of course, splash page design is not the only thing that has been overhauled throughout the years. iSoaker.com has undergone a lot of sitewide file-reorganizations as well as sub-section reclassifications. The iSoaker.com review database was created back in 2003 and has been tweaked a number of times since then. Creating a database, while making some aspects of page creation a little bit tricker, has also allowed user-desired stat searching and sorting that would be impossible using static HTML pages alone. While the sorting and search features on iSoaker.com are still rather basic, the way products can be browsed and sorted has improved over time. In terms of statistics, Aquatechnology reviews featured a handful of blaster stats such as dimensions and capacities. Present reviews also include blaster output and ranges as well as the subjective iSoaker.com Ratings. There was a point I had considered doing away with the subjective ratings, but was convinced by visitors to the site to keep those ratings as well since certain blaster attributes cannot quite be measured and conveyed by raw statistics alone. Site development has gone through many phases with the site undergoing many overhauls throughout the years. Many aspects of site developments have been directly or indirectly influenced through my own interactions and explorations of other water warfare sites and communities as well as various graphic designer websites game sites, etc. Sites such as Super Soaker Arsenal, Flash Flood, and MiB Alliance can be attributed as inspiring me into creating my own water-warfare-dedicated website. The Aqua-Nexus served as the healthy competitor/collaborator site during the early years (between 1999 to 2003). Other sites such as the Aqua Zone, Hydrolysis, Jazz Soak, and Guts'N'Glory Water Warfare, Hydrophiles offered interesting fresh viewpoints on the water warfare scene. In more recent years, sites such as Super Soaker Central and Soaker Media have helped keep my interest alive as well as enlightening me on other aspects of water warfare. Of course, having also had the opportunity to work with InvertedDesign on pages for SuperSoaker.com, itself, in 2001-2002 also affected aspects of iSoaker.com's development as well. Above all, however, perhaps the biggest external influence on the website has been interactions with other water warrior enthusiasts through the various online forums as well as through numerous emails sent to iSoaker.com. It is this shared interest and enjoyment of soaking that is shared by so many others that keeps me inspired and developing this site.